Morning arrival at Port Blair airport, transfer will be provided by the hotel. Check-in the hotel and, lunch will be served. After lunch, sightseeing tour to famous Corbyn's Cove will begin which is approximately 9kms from Port Blair. One can indulge in swimming, sun basking, bathing at Corbyn's Cove. City tour will be followed by Corbyn's Cove. City tour will include excursion to Cellular Jail, Saw Mill (one of the oldest & largest in Asia), Forest Museum, Mini Zoo, Anthropological Museum, Fisheries (Marine) Museum, Centre, Naval Marine Museum (Samudrika), and the Cottage Industries Emporium (Sagarika). In evening, there will be a sound and lightening show at Cellular Jail. It will be a classic narration about the heroic saga of independence freedom fighters. Later, return back to the hotel for an overnight stay. Early morning, tourist will be boarded on the inter - island ferry to Havelock. 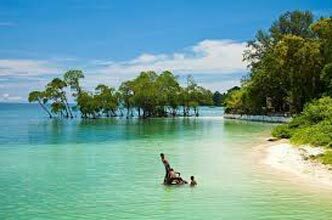 On reaching Havelock Island, travellers will be transferred to respective hotel / resort. After check-in at the hotel, tour will proceed to the Radhanagar Beach, one of the most pictorial beaches on the Islands that ranked 7th among the best beaches of Asia by the TIME Magazine. Return to Port Blair from Havelock. Transfer will be provided from ferry till hotel. The evening is free for leisure or one can go for shopping. Early morning breakfast will be provided at the hotel, followed by an excursion to North Bay via Harbour Cruise. In North Bay Island, witness the exotic varieties of beautiful ornamental fishes and other marine life via bottom of the glass boat. One can go to an optional tour to Ross Island by spending some extra bucks or can enjoy some recreational activities like Snorkelling, Swimming, and Trekking. This is the perfect place for underwater activities as the beach that surrounds the island is treasured with corals, fish and vegetation. Later, return back to Port Blair for an overnight stay at the hotel / resort. Transfer from hotel to the airport will be provided to catch the flight for onward destination.